Erimus Insurance Brokers is set to move into new Stockton headquarters on Bowesfield, Preston Farm Business Park, later this year. Acting on behalf of owners, Suffolk Life Group, property consultancy and chartered surveyors, Sanderson Weatherall sold Kingfisher House, the 7,160 sq ft office building located adjacent to their own offices. Kingfisher House occupies a prime position on Preston Farm Business Park and has excellent road links that connect the business park to both the regional and national road network. Erimus Insurance Brokers, the largest insurance brokers headquartered in the North-East, will occupy two floors of the three-storey building, with Sovereign Global occupying the ground floor. Paul Davison, commerical director at Erimus Insurance, commented: “The location of Kingfisher House is an ideal place for Erimus to operate as we expand our team and client base across the North-East. 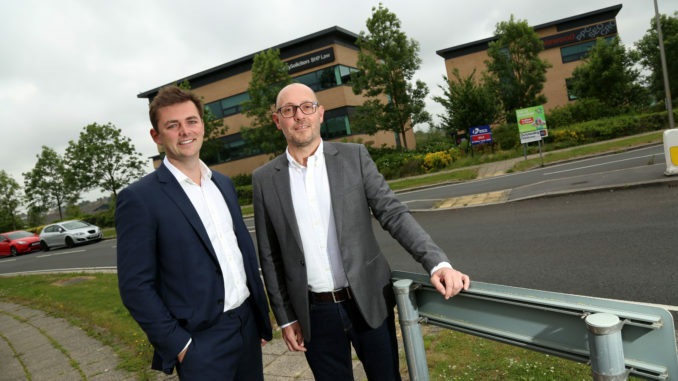 George Williams, agent in Sanderson Weatherall’s Teesside office, said: “We are delighted to have secured the sale of this building on behalf of clients, Suffolk Life Group. Kingfisher House is a fantastic space for Erimus and we look forward to officially welcoming them as neighbours later on this year. The image shows George Williams, agent at Sanderson Weatherall, and Paul Davison, director at Erimus Insurance, outside Kingfisher House.